2018/07/31. The Science & Motion (SAM) Sports Academy conducted two SAM PuttLab Putting Instructor certifications in Australia this month, presented by Dr. Christian Marquardt. The first took place at the Victoria Park Golf Complex in Brisbane and the second at the Rosebud Country Club near Melbourne. 28 local golfers, coaches and club fitters, including some of Australia’s top instructors, attended the one day Level 1 and Level 2 certifications which covered professional use of the SAM PuttLab system, SAM PuttLab fitting, the fundamentals of putting, SAM training concepts, professional putting lessons and green reading. “It has been a fantastic couple of days and some brilliant information from Christian that will really help me and my players to get more out of the SAM PuttLab,” said John Corbett, Head Pro at the Kooyonga Golf Club in Adelaide, after the course. “I am really looking forward to pass on the learned information to my students to help improve their games,” Corbett continued. 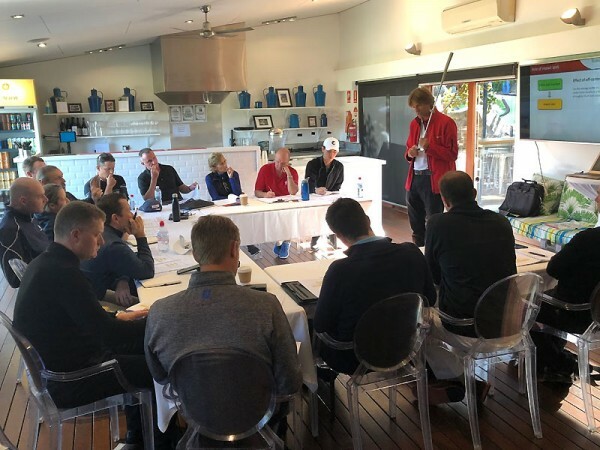 The SAM Sports team thanks both golf clubs involved for hosting and Mark Officer, our sales representative, who helped us with the organization of the second big SAM Academy certification event in Australia. “It was a great time with Mark at the Gold Coast and down here in Melbourne and I very much like to come back soon”, Christian Marquardt said with a look ahead to another great certification in 2019.